There was no holiday hangover for Ohio State. Six days after an imaginable comeback against Notre Dame, the Buckeyes displayed little effects of a letdown. They scored the first 12 points of the game versus Louisiana-Monroe and began the second half on a 15-0 run en route to a resounding 71-31 victory. Ohio State roared out to a 22-4 lead in the first half that grew to as many as 22 before the Buckeyes settled on a 41-20 halftime advantage. The Warhawks, suffering from APR sanctions, were only playing their eighth game of the season – and the sloppiness showed. No. 3 Ohio State scored 14 points off 17 turnovers and limited ULM to 18.5 percent shooting from the field (10 of 54). It didn’t score in the second half until the 9:50 mark. Lenzelle Smith Jr. continued his torrid stretch, which began in the final minutes at Madison Square Garden, scoring a game-high 17 points. LaQuinton Ross scored 15 points and sophomore guard Amedeo Della Valle added 14, the fourth time he’s reached double figures in his career. Smith and Ross alone outscored the Warhawks. The performance from the Buckeye defense is the latest impressive outing in a season’s worth of highlights. Ohio State ranks fifth nationally in scoring defense and 13th in field-goal percentage defense. 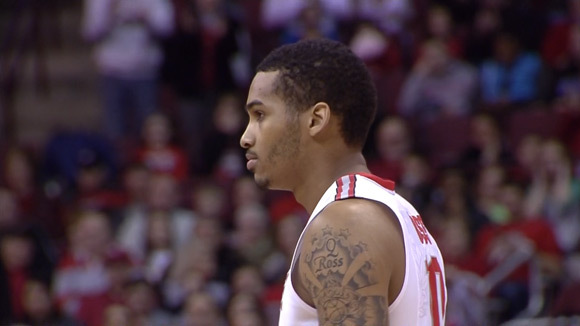 “I think we have to be as good as we can every night defensively,” Ohio State head coach Thad Matta said. The non-conference potion of the schedule is now complete with the Buckeyes sporting a perfect 13-0 record, the fifth time in school history Ohio State’s won its first 13 games. It travels to West Lafayette to play Purdue in the Big Ten opener on New Year’s Eve. The Buckeyes and Wisconsin remain the lone unbeaten teams in the conference.